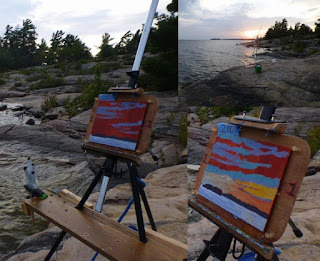 Phil Chadwick's Art: #2001 "Killbear Sunset Across the Twin Points"
#2001 "Killbear Sunset Across the Twin Points"
After setting up my tent in the Granite Saddle Campground of Killbear I headed to the northwest and the lane that lead to the Killbear Visitors Centre. The tent was quick to set-up and almost throws itself together. That left me more time to paint. I was still tired and could have easily talked myself out of painting but there were just too many new opportunities to paint. I am glad that I pushed myself to the easel. I headed to the rocky shore and climbed across a few rocks to the west. The sun was low on the western horizon. Davy Island and the Twin Points formed the landscape to the west-northwest. There were other witnesses to this stunning sunset. I think they were surprised to see a plein air painter almost standing in the water. Some people secretly took pictures - I have nothing to hide. Red clouds at night... sailor's take fright. This sunset was painted using a lot of oils on a smooth and slipper surface.